Dr Tushaar Shah, one of the most renowned water resources experts of India, has taken strong exception to the Narendra Modi government for “ignoring” the agricultural sector in the National Solar Mission, which aims at adding 100 gigawatts (GW) to the already existing power capacity of around 300 GW of the country, slated to be doubled by 2022. Wanting the Centre to subsidize those who replace their current electric tubewells for sucking out groundwater for irrigation, instead of helping business interests with a similar subsidy, Dr Shah, addressing newspersons in Ahmedabad, wondered: Why help the likes of Ambani and Adani instead of farmers in accomplishing the solar mission? Senior flow with the International Water Management Institute (IWMI), Colombo, Dr Shah said, the experiment he has carried out in Thamna village in Anand district of Gujarat suggests that solar power can indeed help replace electric pumps across India, if the Modi government decides to offer “reasonable” subsidy. 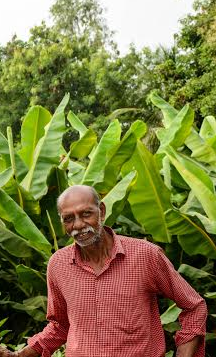 “We have already demonstrated how a farmer, Ramanbhai Parmar, has been successfully using solar pump to use groundwater for irrigate his field, producing banana, even as selling the surplus power he produces to the power distribution company under an agreement”, Dr Shah said. Suggesting this is feasible across India, he said, “The cost of solar power has been going down. While immediately the government may have to offer subsidy, there may a situation when farmers may be wanting to put up solar pumps to irrigate fields without subsidies.” Dr Shah was in Ahmedabad to deliver the first Anil Shah memorial lecture. In fact, Dr Shah said, the farmers should be incentivized by allowing them to sell the solar power they produce to the power distribution companies. Those who are allowed sell their power should be mandated to use drip irrigation. This way, they can earn money, and reducing their dependence on sucking out excessive groundwater. Pointing out “great advantages” of the scheme he has worked out, Dr Shah said, this would set aside the present danger of acquiring huge pieces of land for corporates for putting up solar power plants, as envisaged in the National Solar Mission. Dr Shah said, solar powered pumps would, in the long run, reduce farm power subsidies, which had “initially made groundwater irrigation affordable for farmers” but over time depleted aquifers and bankrupted electricity distribution companies to such an extent that they have hard time managing their rural supplies, becoming increasingly irksome for farmers. Dr Shah’s views acquire significance, as they come from an expert who is one of the strongest advocates of rational groundwater utilization for irrigation. He believes, canal irrigation even today has limited possibilities, as it is riddled with poor management and collapsing government department. He thinks, even the river interlinking project of the Government of India for expanding irrigation is “very theoretical”, suggesting it is not practical.